There’s no better time to create a romantic ambiance in your home than on Valentine’s Day! With just a few changes, you will feel like you are “getting away from it all” without ever leaving your house! If you don’t have time to clean up the whole house, focus on the rooms that you will be spending time in. 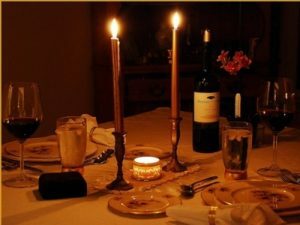 Planning a candle lit dinner? Then, make sure the kitchen counters and table are clear. And if retiring early to the bedroom is part of the plan, be sure clothes are put away and dressers and nightstands are clutter free. Sweeten the air with sensuous scents. Aromas that are pleasing to the senses, or that remind you of romantic moments in your past will conjure up amorous feelings. Light some candles throughout the house and set the mood for the night. Weather permitting, there is nothing more cozy than snuggling by the fireplace. Turn the lights down low, put some soft music on and enjoy the warmth of the fire. Your bedroom should be an oasis, not just on Valentine’s Day, but all year long. Investing in luxurious bedding will be something you will never regret. Getting into bed should feel like a reward at the end of the day! If you’re going to purchase new bedding, create a loving, peaceful atmosphere with warm hues such as red and violet or calm, neutral colors. Choosing the style and color of your bedding is one of the most important things you can do to create a romantic vibe in your bedroom. Even if you don’t want to make it an “all the time” rule, on Valentine’s Day put away your phones, tablets and computers and focus on your significant other. No significant other? No problem. Focus on yourself. Take time to relax and unwind and have a lovely Valentine’s Day!